The IUF Congress in 2017, responding to the widely felt need expressed by affiliates to systematically and seriously organize and recruit young workers, decided to establish a young workers' committee and to ensure that workers 35 and under are represented on the IUF's governing structures. 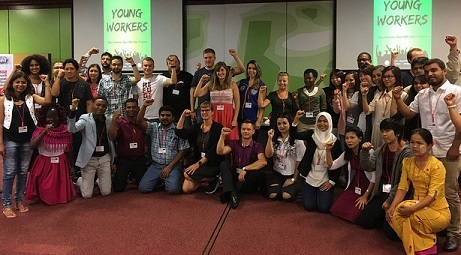 Following on the IUF Young Workers' Conference held in August 2017, an ad-hoc group of young workers was formed to lead the way towards the establishment of an IUF Young Workers' Committee, which will hold its founding meeting in April this year. The IUF Young Workers' Committee will make it a priority to encourage sharing successful examples of organizing young workers. Working with the IUF ad-hoc group and regional organizations, the secretariat has summarized for publication the experiences of affiliates successfully organizing, mobilizing and engaging young workers. Click here to download IUF Young Worker Engagement.